At first glance, a Los Angeles billboard campaign looks like it’s supporting Democratic presidential candidate Bernie Sanders. 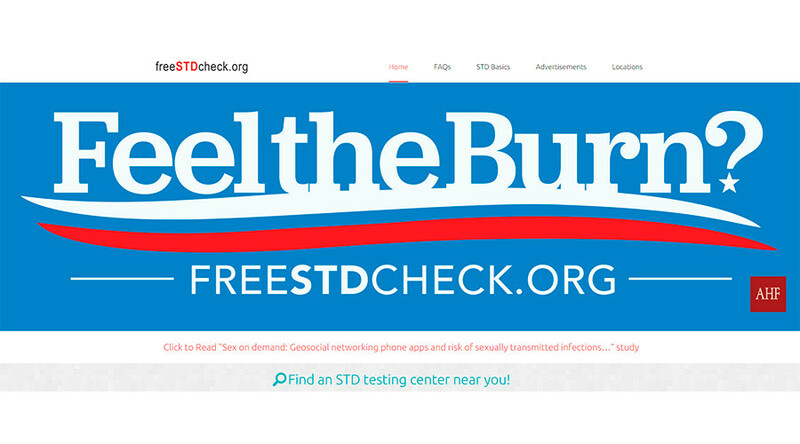 But the sign actually uses the campaign’s color scheme and catchphrase to promote a clinic’s free STD tests. The four billboards were part of an ad campaign from the AIDS Healthcare Foundation (AHF), encouraging people to log onto FreeSTDCheck.org, a website that helps users find the closest center to get tested for sexually transmitted diseases. The design scheme of the billboards is directly lifted from the campaign signs for Senator Bernie Sanders’ (I-VT) presidential bid, and the text is a twist on the presidential hopeful’s slogan “Feel the Bern,” which itself derives from the idiom “feel the burn” that is commonly employed in relation to exercise. "Senator Sanders' powerful message resonates with a lot of Americans, particularly young people," Jason Farmer, senior creative director at the AHF, said in a press release. "We hope that our lighthearted – but highly important – billboard campaign for STD testing will as well." The AHF caused a stir with another billboard campaign for its STD-check website in September, featuring the names of popular dating apps Tinder and Grindr paired with the words “chlamydia” and “gonorrhea.” Tinder sent the organization a cease-and-desist letter demanding that the billboards be taken down. "These unprovoked and wholly unsubstantiated accusations are made to irreparably damage Tinder's reputation in an attempt to encourage others to take an HIV test offered by your organization," the company said.